Keith Haring Keith Haring was born in Reading, Pennsylvania in a town called Kutztown with his father and mother Allen and Joan Haring. He got interested in art when he was young hen studied commercial art at the Ivy school of professional art from 1976 to 1978. After that he lost interest to commercial art and moved on to study fine arts. 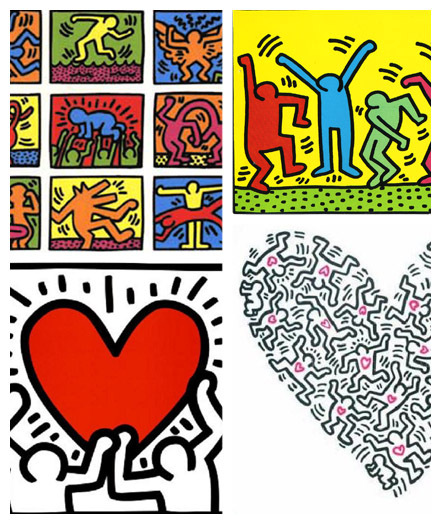 Keith Haring got his first public attention with public art in the subways. These were recognized as pieces of pop art. This time his most famous work was called The Radiant Baby and that became his xsymbol. His lines, colors, and active figures show strong messages of life and unity. Then, during the 1980, he organized exhibitions in Club 57. For the first time of his art career he drew human and animal faces when he participated in Times Square Exhibition. On that same year he photocopied and pasted around the city colleges made up from cut-ups and recombined New York post headlines. In 1981 he drew his first chalk drawings on black paper and painted plastic, metal and found objects. By 1982 he established friendships with artists Futara 2000, Kenny Scharf, Madonna and Jean-Michel Basquiat. He made more than 50 public works between 1982 and 1989 in a lot of cities around the world. One of his famous murals is called Crack is Wack which was created in 1986 and became a famous landmark on New Yorks FDR Drive. At that time he met Andy Warhol who was a theme in Haring’s piece called Andy Mouse. In 1984 Haring visited Australia and painted wall murals in Melbourne and Sydney and was rewarded a $1000 commission to create a mural which was based on his drug addiction. He also painted in Rio de Janeiro, the Paris Museum of Modern Art, Minneapolis and Manhattan. In 1985 he painted canvas and made an appearance on MTV in November. In 1986 he painted murals in Amsterdam, Paris, Phoenix, and in Berlin on the berlin wall at Brandenburg Gate. He also painted the body of Grace Jones for her music video I’m not perfect and opened a retail store called Pop Shop. On February 16, 1990 he passed away due to Aids related complications. As a Celebration of his life Madonna declared the first New York date of her Blood Ambition World tour a benefit concert for Haring’s memory and donated all proceeds to Aids charities.